Voters go to the polls on Thursday, May 3rd. Voters across Burnley and Padiham are being urged to be ready to have their say in the borough elections next month. People who are not registered to vote have until Tuesday to register – visit www.gov.uk/register-to-vote or by ring Burnley Council’s election team on 01282 477261. People intending to vote must be on the electoral roll. “The deadline to register is fast approaching so if you’re not already registered, don’t delay,” said Alison Stirling, the council’s elections officer. “It only takes a few minutes. “If you want to have your say on who represents you, anyone aged 18 or over should make sure they’re on the electoral register and, if they’re not, apply to register as soon as possible. If you’re not registered, then you can’t vote." While residents are encouraged to turn up to their polling station on Thursday, May 3rd, in person to cast their vote, there are other ways of voting for your local councillor. The deadline for applying for a postal vote is 5pm on Wednesday, April 18th; the deadline for proxy vote applications is 5pm on Wednesday, April 25th. To apply for a postal or proxy vote, or for more information, contact the elections office on 01282 477261. 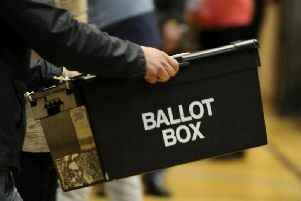 Mick Cartledge, returning officer for Burnley borough, said: “In most cases people go to their polling station to vote in person. However if you can’t get to vote in person there are other ways of voting. “People don’t always realise that they can have their say in different ways, including by post or by asking someone you trust (a proxy) to cast your vote for you. So if you can’t get to a polling station on May 3rd, take a few minutes now to make sure your voice will still be heard.